A 30 year old male presented with a 2 year history of symptoms beginning with a sensation of focal numbness in the left buttock. He also experienced progressive bladder and bowel dysfunction complicated by frequent urinary tract infections. Thereafter, various sensory abnormalities were noted. He described burning and numbness in the perineum and difficulty in sensing the need to empty his bowels. He also reported a burning sensation in the popliteal area which radiated to the buttocks and at times to the sole of the right foot. The latter pain was initiated by touching the area involved, by movement (e.g. walking) and by valsalva maneuvers, but it eventually became constant. There was no significant family or past medical history and his systems review was noncontributory. At the time of admission his mental status and general physical examination were normal. Neurological examination of his cranial nerves and upper extremities was normal. His left hip flexors were graded as normal strength, but the remainder of the muscle groups in both lower limbs were graded as 4 to 4+/5. No reflexes could be elicited at the knees or ankles and plantar reflexes were equivocal. There was decreased pinprick sensation and dysesthesia on the sole of the right foot and perineum in dermatomes S2 to S5. 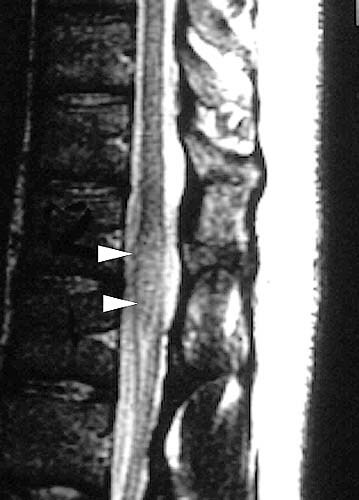 MRI of the spine identified an intra-axial mass lesion involving the conus medullaris expanding the cord in a fusiform manner between T12 and L1. It had high signal intensity on T2 weighted images and was isointense to surrounding cord on T1 weighting. There was no enhancement. The surrounding cord showed changes consistent with edema. The cauda equina was unremarkable. The differential diagnosis included ependymoma, astrocytoma and sarcoid.